34. About three-quarters of the region’s population receive public service from a formal utility, and one-quarter, representing households and communities, rely on self-provision or informal providers. Figure 18 shows the main types of water service providers in the region and the share of the region’s population they provide service to. Larger, regional utilities (whether public or private) already serve close to half the population. As the following paragraphs show, the share is expected to continue to grow, given the ongoing push toward regionalization of smaller, municipal or village-level service providers, which currently still serve about one-third of the population. Despite a few high-profile recent re-municipalization cases, such as in Budapest, privately managed utility companies continue to serve about 10 percent of the region’s population, mostly in larger cities (Bucharest, Sofia) and in selected countries (the Czech Republic, Slovakia). 35. There are over 10,000 formal service providers in the region, with wide variation in size of population served among and within countries, but just 700 serve more than half of the connected population. Austria has the largest number of, and the smallest utilities in, the region, serving, on average, only about 1,400 customers, followed by the Czech Republic, where water utilities serve, on average, a little over 4,000 customers. The small size is expected given the large number of service providers (and municipalities; see Chapter II, Section C) in the Austrian and Czech water sectors. In contrast, Slovakia, where only 17 water companies provide services to over 6 million people, has the largest average size of utilities. The water sector reorganization process that Hungary and Kosovo went through in recent years also resulted in few large companies serving, on average, around 200,000 people; and in Bulgaria, where decentralization never fully took place, the average size remains relatively larger at 130,000. The average size of utilities in the remaining countries ranges from about 20,000 to 50,000 customers (Figure 19). 36. Unsurprisingly, private providers serve on average the largest customer base followed by regional companies, municipal companies, and small formal providers. As Table 1 shows, the few privately managed utility companies in the region tend to have the largest size, at around 175,000 customers served. The more than 600 regional companies, defined as those that serve more than one municipality, serve an average of 70,000 customers, and dominate in countries such as Albania, Bulgaria, Croatia, Kosovo, Romania, Slovakia, and Slovenia. The more than 3,000 municipal utilities serve on average around 12,000 customers and are most prevalent in Austria, Bosnia and Herzegovina, FYR Macedonia, Moldova, and Montenegro. Finally, there are close to 7,000 small formal providers almost exclusively in Austria, the Czech Republic, and Ukraine, with an average size of about 800 customers served. Consolidation of the service providers also had a positive effect on the performance side. The key performance indicators since then have been making steady improvement. For example, the billing and collection ratio and the metering level have increased steadily, allowing better measurement of water consumption, thereby generating more revenue. The staffing level and the operating ratio remained stable, with modest improvements. Yet, NRW fluctuated over the same period, showing limited efficiency gains. 37. In an effort to benefit from economies of scale, establish cross-subsidies, and facilitate absorption of EU funds, several countries are promoting or imposing the aggregation of small providers into regional utilities. Countries like Kosovo and Romania had already embarked on such reforms in the mid-2000s, while other countries, such as Croatia or Hungary, started more recently. These reforms, among other things, set a minimum size requirement, thus necessitating utilities that do not meet this requirement to merge or absorb smaller municipalities, and limit access to state or EU funds to compliant utility providers. The regionalization process in Croatia and Romania is ongoing, with the expectation that it will result in a smaller number of large regional providers. 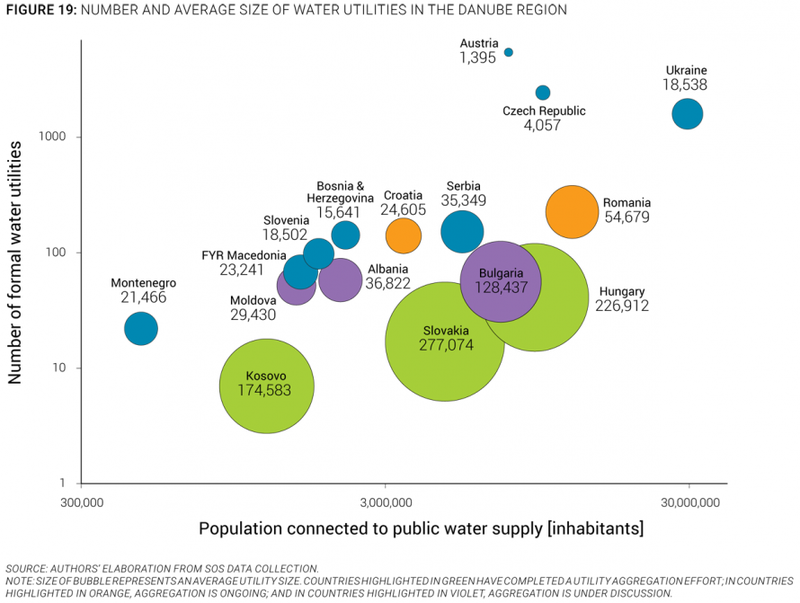 A number of other countries in the region, including Albania, Moldova, and Ukraine, have also identified consolidation of water services as a sector priority, but have not yet adopted a regionalization agenda at the national level (Figure 19). A more detailed discussion of the outcome of those aggregation processes is provided in Section C of Chapter V.
38. Wastewater services management is often provided by the same utility companies, except in a few countries where they are managed by separate companies in larger towns. Historical reasons have led larger cities in the former Austro-Hungarian area (Austria, Hungary) to have different companies for water and wastewater. In fact, in Austria, of about 6,000 utilities, only 150 provide integrated services. This historical separation has also encouraged somewhat more innovative governance models on the wastewater side: Budapest wastewater management is managed by a private company even though the water supply has been re-municipalized; the wastewater treatment plant in Zagreb is operated under a build-operate-transfer (BOT) scheme; in Austria, special-purpose districts (Gemeindeverband) have been set up by nearby municipalities to share the investment and operation costs of wastewater management and treatment facilities. In most of the rest of the region though, wastewater services are operated by the water utility companies. 39. In some countries, municipal utility companies provide more than water and wastewater services. In Slovenia, for example, the type of a utility depends on its size; larger utilities tend to provide water supply and wastewater services only, while smaller ones may also include gas, district heating, and solid waste management, among other municipal services. 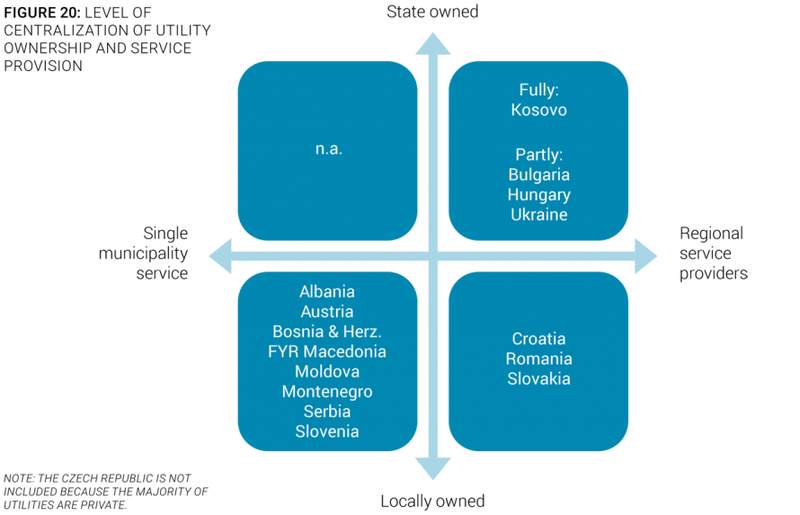 FYR Macedonia is the only country in the region where multisector is the most common type of utility; Macedonian utilities normally provide all communal services to their customers. This was also the case in Croatia until recently, when a new act led municipalities to split water and wastewater services away from their communal enterprises. 40. Most service providers in the region are controlled by local governments and went through a process of corporatization. As a result of a widespread decentralization effort in the 1990s, in almost all countries local governments are responsible for public service provision, and own the service providers, with limited exceptions in Bulgaria, Hungary, and Kosovo (Figure 20). In a review of a dozen well-performing public utilities, World Bank staff identified shared characteristics of those utilities (see box). Legally at least, utility governance in many countries of the region match the first characteristic of external autonomy: the legal personality, accounts, and staff of public utility companies have been separated from the controlling jurisdiction that retains a sole or majority ownership of a corporation’s stock. In most utilities, the shareholding ministries or municipalities appoint the board of directors, with the exception of FYR Macedonia, where nongovernmental representatives can also be members of the board. Utility management is appointed either by the board of directors or directly by the government. 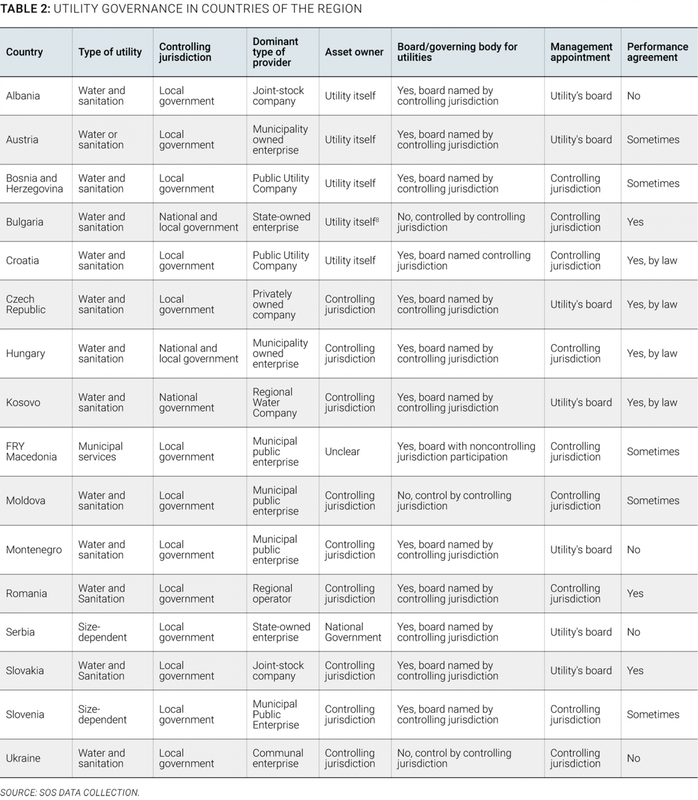 In some cases, the relationship between the utility and the government is formalized in a performance agreement (Table 2). In practice though, the spirit of an arm’s-length relationship between corporatized utility companies and their controlling jurisdiction is not always respected, and local governments and mayors often maintain tight control over managerial and staffing decisions in their utilities. The characteristics of external accountability, market orientation, customer orientation, and corporate culture, are far less often observed. Although utilities do not have complete authority to set their tariffs, they are able to put forward proposals that are consistent with their overall revenue requirements. Public procurement rules, though considered intrusive, were followed without a significant impact on performance. Although most utility managers do not have total control of setting staff salary scales, they are able to hire and retain qualified staff. Most public utilities rely on government to source investment financing. Board members are generally appointed by the government to represent the interests of owners. All utilities are subject to well-defined performance targets. Performance contracts are useful tools for sharing information but have limitations for enforcing performance. The use of external auditors to enhance fiduciary responsibilities is almost universal. Most public utilities require authorization to secure external financing. External groups can be represented in utility advisory or management oversight bodies. Independent regulatory arrangements are the exception rather than the norm, because most utilities are regulated by their owners. Senior management systematically reports to their boards on performance. Incentive-based systems for top management are common. Staff members are also subject to rewards and penalties to achieve well-defined performance targets. Most public utilities have focused on training for improving staff skills. Utilities outsource mostly noncore functions and retain core functions. Although benchmarking exercises are becoming common, there are no clear-cut paradigms for using data collected for improving performance. Most utilities are not involved in market testing. Public water utilities have developed billing and collection systems that best overcome specific constraints faced by various groups of customers. Public utilities actively survey their customers to learn their opinions and views. Customers have the opportunity to express their preferences regarding service options. Customers are informed about service changes or interruptions. Utilities have developed effective complaint mechanisms. Well-defined mission statements provide an internal indicator of good corporate culture. Performance is the basis for salary increases in most utilities. Utilities provide ample career opportunities to their staff and experience low turnover. Water utilities have training programs for their staff as part of their annual performance agreements. Staff members are informed of management decisions on a need-to-know basis. Source: Baietti, Kingdom and van Ginneken 2006. 41. Most countries in the region did not embark on significant private involvement in the provision of water and wastewater services. In the late 1990s and early 2000s, several countries experimented with PPPs for their larger cities, leading to concession contracts being signed for cities such as Bucharest, Budapest, and Sofia, as well as a large share of the population in the Czech Republic and Slovakia. A management contract was also attempted in Gjakovë-Rahovecare in Kosovo. More recently, Ukraine has developed a number of notable public-private partnership (PPP) schemes, such as the long-term lease agreement between the City of Odessa and the privately owned company Infoxvodokanal, and a large scale concession contract between Luhansk Oblast and the Russian private operator Rosvodokanal. At present, though, few of the countries continue to actively pursue the traditional concession model, with services in Budapest, for example, being re-municipalized. A number of softer PPP models are emerging, however, for the management of specific facilities (BOTs in Zagreb, Serbia, and Kosovo) and for the delivery of outsourced services, sometimes on a performance basis. 42. Every country in the region has a utility association, and sometimes more than one. 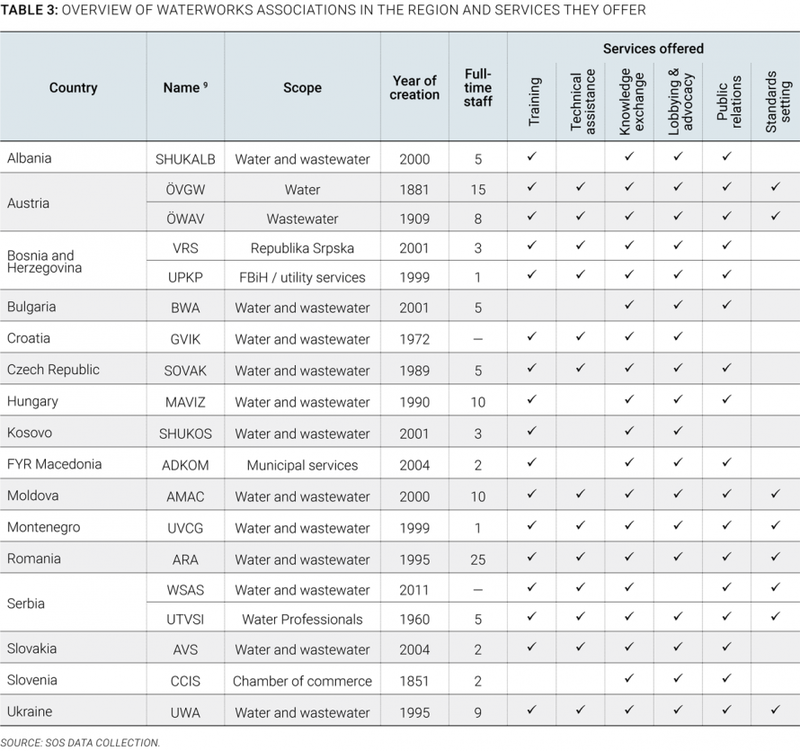 Strong waterworks associations exist in most of the EU members, led, for example, by ÖVGW in Austria, MAVIZ in Hungary, and ARA in Romania. In most countries of the Former Yugoslavia though, the creation of such associations is more recent, and their human and financial capacity more limited. Knowledge exchange activities such as conferences, workshops, and journals are the most popular services provided by associations to their members, followed by association lobbying and advocacy work. Seven associations in the region draft and set technical standards and guidelines as part of their service offerings (Table 3). 43. In rural areas, water services are normally organized through a nearby utility, community-based organizations, or self-provision. Overall, self-provision and community-operated systems account for about 26 percent of the population. Little is known about the informal service providers, which are normally beyond policy and regulatory reach and thus pose particular challenges for the sector due to their small size, limited technical and financial capacity, and large numbers. Many countries in the region consider the aggregation or integration of such smaller providers into regional utilities as the most viable option to improve the quality and sustainability of services. However, such solutions might entail significant additional costs for public utility companies, and countries that traditionally have had to deal with such situations, such as Austria, have developed alternative mechanisms to provide support to those service providers, as the experience of Upper Austria Water shows (see Box). Founded in 1946, Upper Austria Water is an autonomous, self-reliant, nonprofit association of more than 1,700 cooperatives located in the Federal State of Upper Austria. Chaired by a board of seven directors, it manages water-related activities, especially in rural areas, and is in charge of decentralized, small-scale water supply and sewerage installations and flood protection and irrigation. Water cooperatives aim at securing sufficient, high-quality, and cost-efficient drinking water supply through the construction and operation of autonomous installations. The personal involvement and honorary services of members make this collective quality-controlled water supply an economical method of supply. The association provides support to its members on technical, legal, financial, and organizational issues. It supplies operational and maintenance services (technical assistance, emergency supply, mobile technical equipment), pooling programs (for water meter purchase and water analyses, for example), and measurement services (such as leak detection, pipe and valve location, flow rates and pressure, and aquifer tests). It also proposes education and training sessions and conducts networking activities and information exchange opportunities for its members. For more information, see http://www.ooewasser.at/de/english.html.